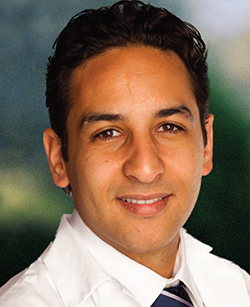 Dr. Molayem received his bachelors degree from UCLA. He continued his education at the prestigious UCLA School of Dentistry for his Doctor of Dental Surgery degree. Upon graduation, he was the recipient of the Nathan A. Styrt Scholarship Award, Alpha Omega Dental Fraternity president’s plaque, and Award of Excellence by the IADA for his leadership in promoting diversity and community outreach programs at UCLA. In pursuit of his passion for surgery and dental implants, he completed a rigorous 3 year specialty program in Periodontics, Dental Implants, and Reconstructive Surgery at USC School of Dentistry. He is the Founder of both the UCLA and USC Journals of Dental Research - The Explorer. He has published and conducted research in the field of dental implants. Additionally, he has presented his research on Immediate Implants nationally and lectured internationally on topics of periodontics and dental implants. More recently, the California Society of Periodontology awarded Dr. Molayem with the Straumman Research Scholorship Award. He was also selected as a course instructor to teach other dentists on dental implants for Osstem Implants. Dr. Molayem is an active member of organized dentistry at the American Dental Association (ADA), California Dental Association, Alpha Omega Dental Fraternity, California Society of Periodontology, and a committee member on the American Academy of Osseointegration. Dr. Molayem is happily married and in his limited time loves to read, travel, hike, and play soccer.